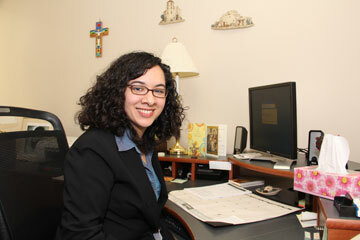 Joann Roa, director of the Office for Hispanic Catholics of the Archdiocese of Philadelphia. Although Joann Roa is first generation American, the daughter of immigrants from Nicaragua, when she entered college she never dreamed that one day she would one day become director of the Office for Hispanic Catholics in Philadelphia, the office she assumed in January. Born and raised on Long Island the sixth of seven children of parents who came to America seeking a better life, she attended Our Lady of Loretto Parish which had a Spanish Mass in the basement. She attended local public schools and began her college education at Hofstra University with the goal of attaining a degree in business computer information systems. Meanwhile she was becoming very active in her faith, and it was a friend, Franciscan Friar of the Atonement Luke Fletcher, who suggested she transfer to Franciscan University of Steubenville which she did. Roa took her undergraduate degree in theology with a minor in Franciscan Spirituality, with a view of a career in Church ministry. Through friends who had already graduated she discovered most places were looking for a master’s degree, so she stayed on and obtained a master’s in theology and Christian ministry. With an interest in missionary work after obtaining her degree she joined Kerygma (Service through Christ) Teams, the Catholic branch of the Christian movement Youth with a Mission. She was sent to Dublin for a hands-on discipleship training program. “We visited schools, we gave talks on the Trinity, on relationship and chastity, and there was a part-time radio ministry. That was hard because I’d never done that before, but I’m glad I did it,” she said. Upon returning to the United States, she stumbled upon a notice of an opening at Steubenville as a residence director, applied, was accepted and did that for three years. “It enabled me to give back to my alma mater,” she said. After that, in 2009 she entered Hispanic ministry as director of the Office for Hispanic Catholics for the Diocese of Kansas City-St. Joseph. “I didn’t seek it, I was led to it and it has been an incredible blessing,” Roa said. She also quickly discovered it is a diverse ministry; Midwestern Hispanics are not the same as New York Hispanics and they are not the same as California Hispanics. But it is an important ministry that serves the needs of many people, not only the ones who have been here for a while, but the newcomers. The biggest problem she finds in Hispanic ministry in general is the lack of workers sufficient for the needs, “but that is the same in many ministries,” she said. Although Roa attends Mass in both English and Spanish, she well remembers the Spanish language Mass of her childhood. “It was beautiful when needed and solemn when needed,” she recalls. “It doesn’t matter what country the people are from, the Spanish Mass is home,” she said. In addition to her various ministries Roa has attended four World Youth Days ‑ Paris in 1997, Rome in 2000, Toronto in 2002 and Madrid in 2011. “They are not a vacation, it is work,” she said. Now her travels have brought her to Philadelphia, and it is not because of wanderlust, it is because of something deep in the Hispanic psyche, and that’s family, and this brings her close to her own roots. Philadelphia will be somewhat different; she knows the Archdiocese of Philadelphia is much larger than Kansas City-St. Joseph. She really hasn’t gotten her feet wet yet, “but I love our staff, and I love the camaraderie, at lunch we get together to eat, and I think in ministry that is vital,” Roa said.